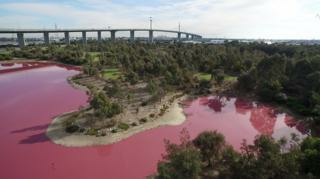 A salt lake in Melbourne has turned pink due to a combination of sunlight, warm temperatures and low rainfall. Wildlife officers said algae growing in the salt crust at the bottom of Westgate Park's lake produce a red pigment. "Enjoy the views, but we recommend you don't come into contact with the water," Parks Victoria said. The phenomenon also occurs in Spain's Salina de Torrevieja, Canada's Dusty Rose Lake and Senegal's Lake Retba. In Australia, the natural occurring sight can be seen in Victoria's Murray-Sunset National Park and Western Australia's Lake Hillier. Dr Mark Norman, Parks Victoria chief conservation scientist, said the colouration was caused by a harmless, single-cell alga known as Dunalliela. "It's completely natural," he said. "We often get comments that it looks like an industrial accident of pink paint." Dr Norman said that even though the water is not dangerous, he would not recommend taking a swim. "It's so salty and muddy on the bottom that you would come out looking like a frosted rum ball, especially when you dried," he said. Parks Victoria said the lake is expected to return to blue when the weather cooled and the rainfall increased.